Last week, I shared tips for day trips that pair apple picking with wine tasting in Virginia. I love the idea of apple picking and the thought of making homemade apple crisp; however, I usually end up with one apple crisp and a LOT of leftover apples. Rather than eat an apple a day until next apple season, I decided to make a seasonal sangria. It’s easy and it’s white wine based, so it’s perfect for transitioning from summer to fall. I modified another sangria recipe by adjusting quantities of ingredients to get the right level of sweetness for my personal taste (my tastes tend toward “slightly sweet” when it comes to cocktails). Sangria is a great drink for entertaining because you can keep adding to it so that the supply can keep up with the demand. Combine the Moscato, Limoncello, and sugar and stir until the sugar dissolves. Zest and juice the lemons into the mixture. Core and thinly slice the apples and pear and add to the sangria. (Tip: Slice the fruit just before adding to the mixture, otherwise, it may start to turn brown.) Stir and refrigerate for at least three hours. Just before you’re ready to serve it, top it off with seltzer. Serve over ice. Also, check out these great homemade applesauce recipes for kids of all ages from a great new blog called Feeding Jack. It has great advice on making healthy food for kids. 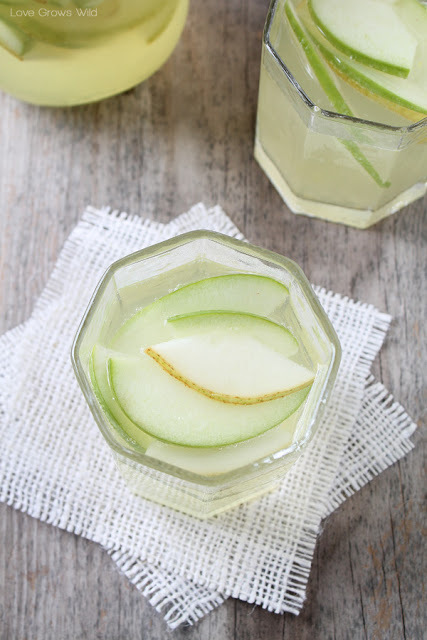 One Response to "Recipe: Apple and Pear Sangria"
Thanks for sharing my Apple and Red Wine Soup!